This title was first published in 2002.In recent years scholars have begun to conceptualize the history of the Pacific Ocean as a subset of world history. This question is taken up in the introductory chapter of this volume, which sets out four periods of modern Pacific history: a silver period, 1570s-1750; a period of early integration, 1750-1850; a gold period, 1850-c.1900; and a period of imperial strategies after the gold rushes. The next chapter looks at the fur trade of the Pacific coast of America, and its dependence on markets in China and Russia, followed by a set which focus on the era of the gold rushes, in California, Australia and New Zealand, when the pace of Pacific integration grew rapidly and new markets opened across the ocean. The last chapters examine aspects of the subsequent evolution of the Pacific Ocean into an ’American lake’, looking in particular at the interlocking of politics and migration. 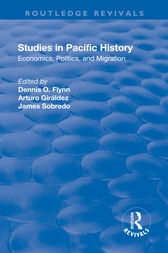 This volume carries forward study of the ’Pacific Centuries’, promoting the conceptualization of the Pacific Ocean as a coherent unit of analysis, and providing further important steps toward provision of the multi-century framework that is required for proper understanding of today’s ’Pacific Century’.